Are you interested in learning more about our dust management services? Contact us today! Depending on what products you manufacture, your dust buildup can skyrocket if you don’t have a cleaning program in place. However, it’s important to deep clean your workplace for dust more than just once a year. As your employees work, encourage them to keep a watchful eye on dust buildup and report any thickening issues. Three elements needed to make a fire include heat, oxygen, and fuel (such as dust). Make sure that these three elements are controlled and watched carefully. Additionally, when cleaning, use cleaning materials that does not create dust clouds – as this is a very common ignition source. 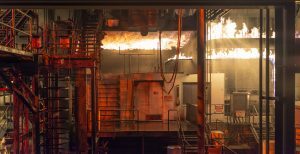 Remember, a fire can occur in a split second, so make sure your employees know exactly what to do in case dust catches fire. Dust can collect in places that your eyes cannot see such as on ceiling rafters or in confined spaces. However, the team at First Environmental is highly qualified and trained to clean the dust in hard-to-reach places. After hiring us for our dust management program, you will feel confident in the safety of your workplace. Are you unsure if you need our services? Check out this list of products that OSHA declared has potential for a dust explosion. Then, call us toll-free at 1-888-720-1330 to schedule an inspection.